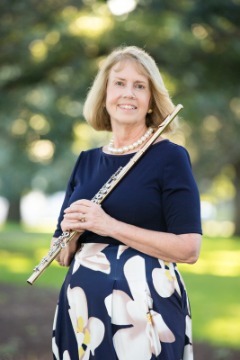 ​ Tacy Edwards, Manager of the North Charleston POPS!, is Principal Flute of Orchestra Kentucky, the North Charleston POPS!, Second Flute in the Hilton Head Symphony Orchestra, Piccoloist with the Charleston Symphony Orchestra and the New Sousa Band. She co-founded the North Charleston Pops!, based at the North Charleston Performing Arts Center, to bring invigorating popular entertainment with wide audience appeal to coastal Carolina, as well as to provide employment for the many highly talented musicians that make their home in the region. Under her leadership, the new North Charleston POPS! has already gained recognition as a vibrant addition to the arts scene of the Low Country and is being sought after for concerts on sites throughout the region. They were featured as the headliner for the North Charleston Arts Festival Gala and for the 2013 4th of July celebration at Riverfront Park in North Charleston. In addition to her management skills, as a performing artist Tacy has three CD releases: The Water Is Wide. Hauntings, and Solo and Chamber Works for Guitar by Radames Gnattali (nominated for a Grammy Award in 2010). She is the flute professor at the College of Charleston and owns and operates the “Classically Charleston” booking agency for musicians. If asked to describe herself in one word, it would be a “builder.” She enjoys construction and restoration work as a hobby and a vocation, building orchestras, relationships and opportunities as a volunteer, and memories, special events and mentorships as a musician. Tacy has served as President of the Charleston Symphony Orchestra League and has chaired four Designer Showhouses for the CSOL, including the Showhouse that was featured in Southern Accents magazine a few years ago. She has traveled as a performing artist to the Far East, South America and around the USA. She is a voting member of the Recording Academy and enjoys attending Grammy events. She divides her time between South Carolina and Kentucky (the Charleston and Nashville areas) and is very active in the music scenes in both regions. the mother of twin daughters and now a grandmother, she leads a very active family life, too, which she treasures.